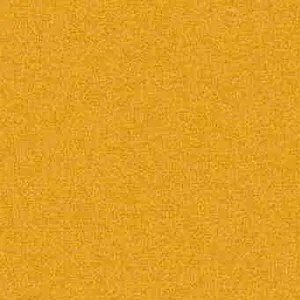 The color yellow is associated with many things from the sun and bright flowers, to cowardice, caution and aging. Vintage yellow pens are fairly rare. The most famous is the Parker Mandarin Duofold, which can value at over a thousand dollars in pristine condition. This week’s pen is far from a Duofold, but a nice example of a third tier imitation from the same time period, if not a bit later. 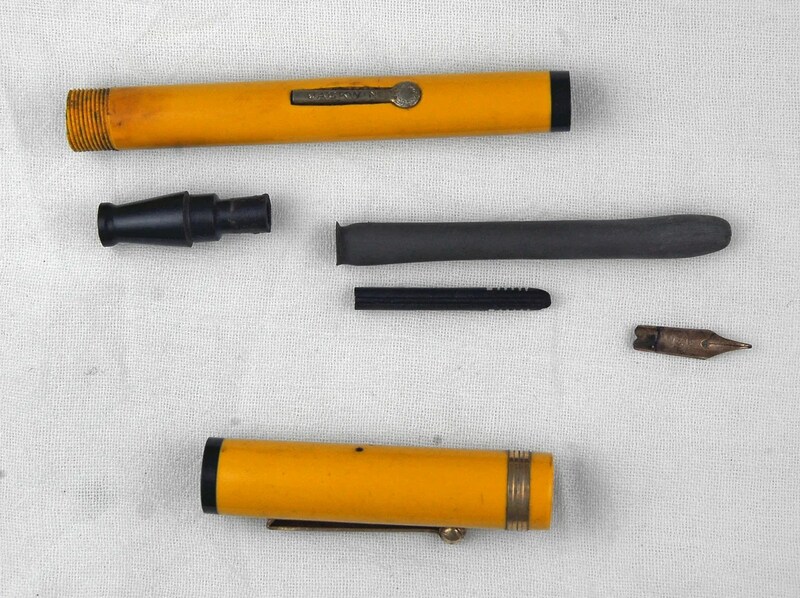 Below is the exploded view of a Jackwin Fountain Pen in Mandarin Yellow, probably manufactured in the 1920s or early 30s. You can see the typical staining of the barrel and cap from years of neglect. The old size 16 sac has hardened and the nib is very dirty. I cleaned all of the parts in the ultrasonic cleaner and then scrubbed the barrel and cap, inside and out, with a dremel and Pentiques scratch remover and polish. With these light colored plastic pens, extra time needs to be spent on the threads (0n barrel and inside cap) as they are very often badly stained. I use Ink Nix and a toothbrush, followed by a trip to the ultrasonic cleaner, and repeat. The gold furniture polished up well. The photos below make the clip and cap ring appear washed out, but they retain their gold color and this is a camera (and camera operator) problem. I cleaned the section and feed in the ultrasonic cleaner and reinserted the feed and polished nib into the section. The nib is a small Warranted 14K nib with no size number. I installed a silicon size 16 sac and reassembled the pen. The final restored Jackwin is below. I have placed this pen as a US production (NY / NJ) in the late 1920s. This coincides to Eclipse’s history and their production of these colorful flat top pens that resemble the popular Parker Duofolds and similar pens of the day. I think every vintage collection should contain one Yellow Pen as they are an interesting corner of the fountain pen history. Often difficult to find and expensive (Duofolds), these third tier pens are a very attractive alternative to supplement your collection. Large Flat Top fountain pens from the 20s and 30s are some of my favorite pens due to their size and comfort in my hand. They also tend to have large nibs that hold up to extended use and their sacs hold more ink. Below is the Black pen after I have taken it apart. You can see that the j bar is broken at the top, which is quite common. The sac is still shaped, though hard as a rock. I used a new j bar and a size 18 sac in this repair. I thoroughly cleaned the section of all remains of the old sac and shellac. This is necessary to assure a solid adhesion to the new sac. The feed and nib were cleaned. The nib is a plain 14K Warranted nib that is similar in size to the Warranted No. 8s found often in these over-sized flat tops. 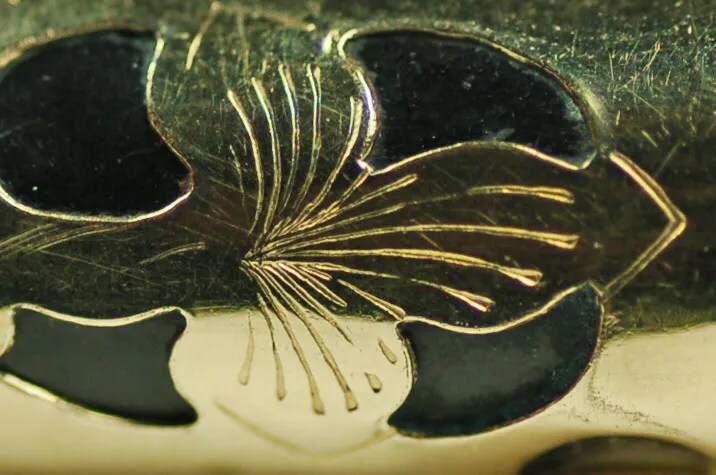 The clip was previously polished vigorously and has lost much of its gold plating. This is the only negative to the pen. The lever, cap band, and nib are still shiny gold. The clip is imprinted with “MARXTON” below a wreath. The lever has a wreath at the circular lift point. There are no imprints on the barrel, though there is a smooth section for an engraving. The rest of the cap and barrel is a series of six tight lines from top of pen to bottom separated by a smooth alley. Marxton Pens were a brand of Eclipse Pens. You can refer to a post on Eclipse with references here. Marxton and Park Row were lesser brands under the Eclipse banner. Marxton gets its name from the founder of Eclipse, Marx Finstone. This is the only Marxton that I have touched, but I have seen photos of some very colorful large flat tops. I would date this pen to the late 20s / early 30s time period, though I have no direct advertising evidence. The pen measures 5 5/16″ closed and 6 3/8″ posted. This past weekend I decided to visit a local antique mall with one of my daughters. 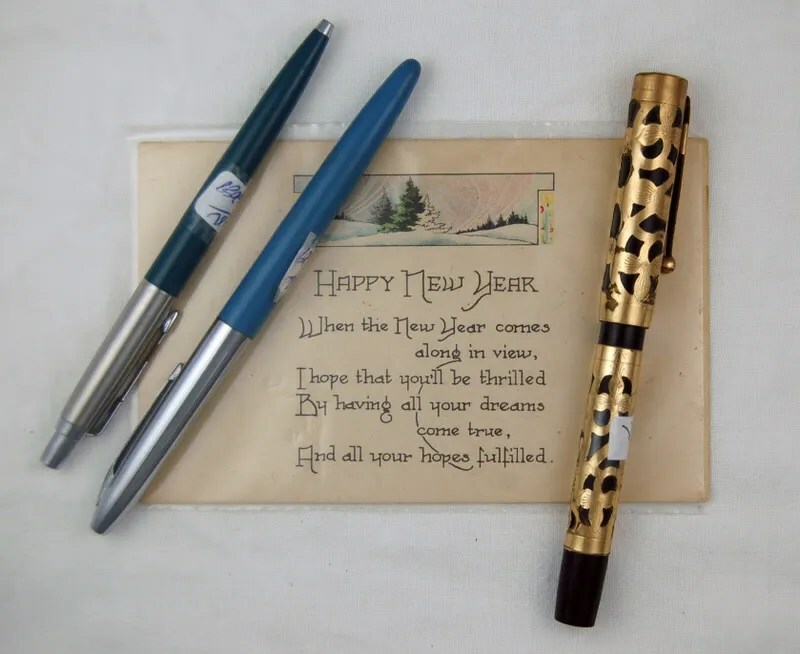 It is near where I work and several visits over the past several years have netted little of interest to the pen collector other than a stray ink bottle or blotter. Here is a photo of the pen after I got it home and took it apart. I was a little worried about the gold and if it was a cheap gold plating, but a trip to the internet and test of a small corner revealed that I would be able to polish it to my heart’s content, with no worry of ruining the finish. The first thing I tackled was polishing the gold. It came out very well and it really shines. I removed all of the old sac and cleaned out the cap, section, and feed. The nib on the pen was a “Durium” gold plated nib, that would lose it’s gold color with any attempts to clean it. A pen this beautiful on the outside deserves better, so I searched my parts bins for a suitable replacement. Using the old nib as a size model, I determined that a Waterman No. 2 nib was the same size and the fit was perfect. So I replaced the nib and fitted the nib/feed back into the section. After sanding all of the old sac off of the section I was able to fit a size 16 sac firmly to the end. The old j-bar needed to be replaced as well, and after fitting a new one in I fit the section back into the barrel. Here is the finished product, water tested and ready to write. The Eclipse Pen Company was founded by Marx Finstone and had offices in New York and Toronto, Ontario, Canada in the 1920s. I estimate this pen was manufactured in the 20s in the New York location. In summary, Eclipse Pen made their name line and a few lower priced lines, including Marxton and Park Row. Their higher line pen was the Monroe. I have seen a few of these and they are known for their interesting styling and stepped caps. The information also refers to the Klein Clip. Here is a close up. These pens typically came with Eclipse or Warranted nibs. As I mentioned above, I had a Waterman from an old Waterman 52 parts pen, and here is a close up of that nib, which fit perfectly into the section. It was the same size as the cheap gold plated nib that came on the pen. Here is a picture of the Waterman Ideal New York No. 2. Finally, a nice close up of a crisp lever imprint and some detail of the flowery etchings on the filigree. 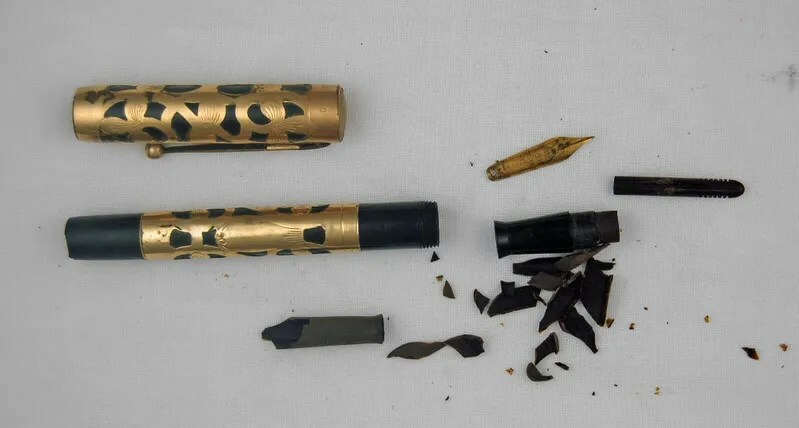 So, if there is a moral to this pen restoration it is to keep up the hunt for nice vintage pens. You never know when you might stumble into a gem. Oh, and as the timely postcard states: HAPPY NEW YEAR !!! !